>I’ve been sick for several days, which is why you haven’t gotten a post since last Thursday. We were still in Atlanta over the weekend, visiting my husband’s relatives, but we got home just in time for the Super Bowl last night. What a great game! We aren’t huge fans of either team, but they sure put on a show last night. So, I dragged myself out of bed a little while ago and thought, “Alas, I’ve neglected my blog readers, and I don’t think they’ll be excited about the pictures of my great niece and nephews and other family members in Atlanta, so what’s a sickly blogger to do?” And then it hit me: review someone else’s (professional and historic) photographs. 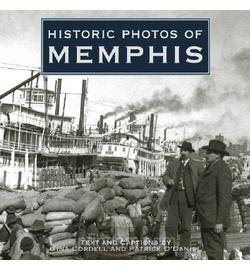 I recently received a really nice coffee table book called Historic Photos of Memphis by Gina Cordell and Patrick W. O’Daniel. It’s been out since 2006, but this was my first time to see it. It has 198 photographs covering 133 years (1860-1993) with helpful section editorials and notes on each photograph. Since I’ve only lived in Memphis since 1988, I really enjoyed this visual trip through my second hometown’s history. It was especially fun to look at the Illinois Central Railroad—both the train cars and the station—since the first time I visited Memphis, when I was 8 years old, was by train. My best friend in Jackson (Mississippi) was coming up to visit relatives, and I rode with her, back in 1959. My next train trip to Memphis was in 1968, to visit my boyfriend, who was a freshman at Southwestern (now Rhodes) so I enjoyed the photo of Southwestern, noting how the architecture and buildings never change, only the coeds! The views of the riverfront are fascinating, especially since we lived at the Waterford Plaza, overlooking the river, when we first moved to Memphis. And also the old Goldsmith’s Department Store (downtown) which was still open, but only briefly, when we came here. I was sad when it closed…. it felt like the end of an era, the excitement and buzz of shopping downtown. But it’s heartening to see the historic homes which have been preserved and now function as elegant museums, restaurants, and bed and breakfasts, like the Hunt Phelan Home. Lots of “first” are captured by these photos, like the first interstate highway to go through Memphis, and the first non-stop flight to New York City. 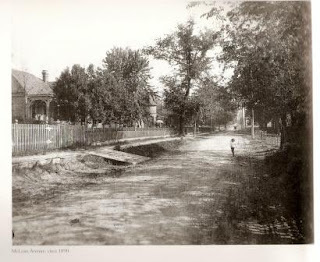 Okay, I can’t help but try to scan this one… it’s just a street scene—on McLean Avenue—a few blocks from where I live, but it’s back in 1890. I’ve got friends who live on McLean now, and I’m sure they’re grateful for the paved streets and sidewalks, but also the historic architecture, which has been preserved for the most part. Visit Turner Publishing’s website or your local independent bookseller (links to a few of my favorites are here) to get your own copy of this treasure. (Yes, of course you can order it from Amazon, but you know I always like to plug the indies.) Okay, time for Tylenol and cough medicine and a nap.